Lightweight meets light-speed in Team Daiwa's Steez High-Speed Baitcast Reels. Boasting a blazing fast 7.1:1 gear ratio and an ultra-light yet durable magnesium body design, the Steez High-Speed Reels offer bass fisherman the ultimate combination of lightweight performance and line-burning speed! Steez High-Speed Reels feature a free-floating, A7075 aluminum spool that starts up fast and spins longer. This innovative spool design works in conjunction with Daiwa's exclusive Magforce-V automatic anti-backlash system to allow for long, trouble-free casts. 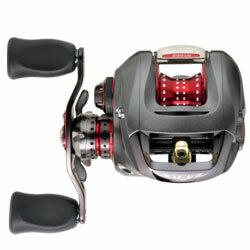 "I have a total of 5 Steez reels one of these and 4 of the slower speed models.. I have this one rigged on a 6.9MH fast tip Carrot stix and the rig is just silly light the other 4 I have rigged on Steez rods and they are awesome as well! my 14 Zillions are all rigged on Carrot stixs as well! and these reels are awesome by all means the Zillion IMHO is about the same casting and feel of this reel other then weighing more (I do own 5 Steez for a reason tho) they are by far the best reel on the market when you are looking for the lightest smoothest best casting (Also this reel has the Type R spool that used to come ONLY on the over seas "Tuned" Reels like the Pixie type R) and that does make a big diff it adds a easy 20 feet on casting when you want it over lets Say the Zillion or SOL..."